The teaching of the blood moons has recently captivated the attention of the religious world. According to the EndTimes Ministries a lunar eclipse occurs when the earth passes between the sun and the moon. This blocks the sun’s rays from reflecting off the moon as normal. However, some of the sun’s rays curve around the earth causing the moon to appear red during a total eclipse. 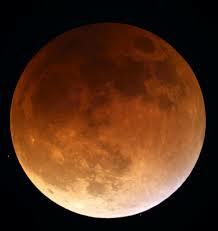 Because of its vivid color, a total lunar eclipse is often referred to by NASA as a “blood red moon”. The occurrence of blood moons is quite common, normally happening at least twice a year. Most of us have seen the moon when its appearance changed to red. When four total lunar eclipses happen in close succession, NASA refers to this as a “tetrad”. The first tetrad in over 500 years took place around the time of the Spanish Inquisition in 1492. That was when the Jews were kicked out of Spain (and “Columbus sailed the ocean blue”). This monumental upheaval and deliverance of the Jews followed close behind in 1493. Many Jews survived and escaped to what became known as America. The next tetrad, 450 years after the previous one, was when Israel became a nation again on May 14, 1948. The next tetrad, and significant event for Israel was in 1967 during the 6 Day War when the Jews took back Jerusalem. Their ancient capitol was undivided and under Jewish control for the first time since the destruction of Jerusalem by the Romans in 70 A.D.! And if that isn’t enough, (drum roll)….all of these total lunar eclipses have been on the Jewish feast days of either Passover or Sukkot. The odds of that happening are about a billion to the trillionth power! Does the Bible mention Blood Moons? The term blood moons is mentioned 3 times in the Bible…. So what do we do? Is there any hope? I’ve heard it said, and I agree, that at this point, only a genuine and deep repentance will turn us toward the mercy of God. The most important question to ask ourselves is if we are ready. Have we chosen to remain as we are, or have we counted the cost of full surrender?